The Duksa Family Funeral Homes in New Britain and Newington are among eight Connecticut Funeral Homes that have received a national recognition by earning the 2018 Pursuit of Excellence Awards for their outstanding service to the community. On Tuesday, the Connecticut Funeral Directors Association (CFDA) announced the recognition, which is presented annually by the National Funeral Directors Association (NFDA). All of the Connecticut funeral homes that earned the award are members of the CFDA. The award is given to businesses that have demonstrated commitment to excellent funeral services by complying with professional and ethical standards and by offering superior service to families. Some of the requirements that need to be met by funeral homes in order to receive the award are pledging to ethical practices, providing innovative programs, leadership and staff development programs, family outreach, support services, and technological opportunities. The 2018 Pursuit of Excellence Award will be given to 159 funeral homes around the world. 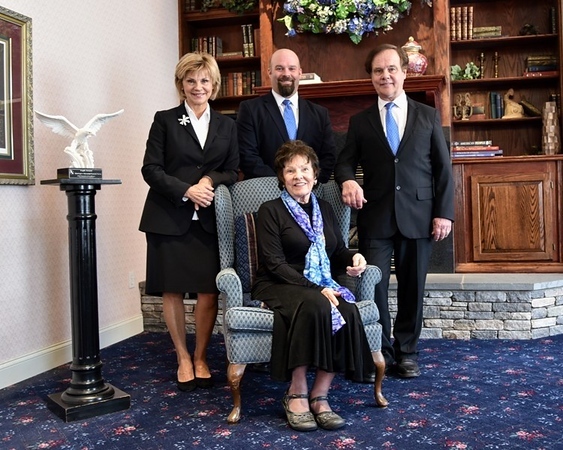 The eight Connecticut funeral homes receiving the recognition are Alderson-Ford Funeral Homes Inc. in Naugatuck, B.C. Bailey Funeral Home in Wallingford, D’Esopo East Hartford Memorial Chapel in East Hartford, D’Esopo Funeral Chapel in Wethersfield, Duksa Family Funeral Homes at Burritt Hill in New Britain, Duksa Family Funeral Home at Newington Memorial in Newington, Howard K. Hill Funeral Services in New Haven and Leo P. Gallagher & Son Funeral Home in Stamford. The Pursuit of Excellence Award is not the only recognition the New Britain Funeral Home is receiving. This year, the Duksa Family Funeral Homes at Burritt Hill will be inducted to the NFDA Hall of excellence for receiving the Pursuit of Excellence Award for the 10th time. Diana Duksa Kurz, co-owner of the Duksa Family Funeral Homes, praised the staff members by acknowledging that this recognition has been possible because of their hard work and dedication. “It’s a recognition that makes us very proud of our staff, of all of the commitment and devotion that our family and our staff members have for the people that we are serving, for the families that we are taking care of, and for the community,” Diana Duksa Kurz, co-owner of the Duksa Family Funeral Homes, said. The Duksa family owns three funeral homes in two facilities that are independently owned by the family. The Pursuit of Excellence awards will be officially given to the recipients on Oct.15 at the 2018 NFDA International Convention and Expo in Salt Lake City. Posted in New Britain Herald, New Britain on Friday, 7 September 2018 20:07. Updated: Friday, 7 September 2018 20:09.